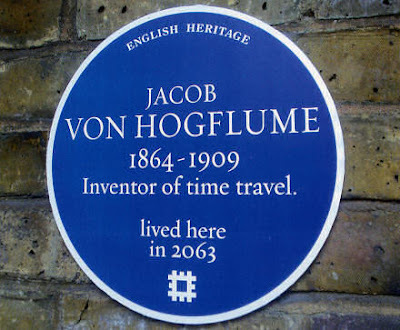 This photo, apparently of a tribute by English Heritage to time traveller Jacob von Hogflume, has been leading a life of its own for the last couple of years online (google "Hogflume") -- including, it seems, a brief career at Wikipedia. Turns out to be from a book called Signs of Life by advertising men Dave Askwith and Alex Normanton (more examples via BBC News). Normanton, a graphic designer, found the correct fonts and mounted the signs on card and paper. Askwith then photographed them in their natural geographical habitat. He likens it to the guerrilla, subversive interventions of the graffiti artist Banksy. Sometimes, especially on the train, he left the signs up and sat waiting for a fellow passenger to register them. "They'd sit there, stare into space, then look at the sign and it didn't say what they expected it to say, and they'd look confused as if to say, 'Hang on, what's going on here'." ~Tim Teeman, "Time of the signs", The Times (London), 21 December 02005. Normanton adds: "If our joke signs didn’t actually look real, people wouldn’t take notice, wouldn’t get the joke." It seems the increased likelihood of not noticing the joke, because of the signs' verisimilitude, is also what makes them work. Hmm. Don't "save it for 2050"